Whenever a debate reaches a point of intractability, it can be helpful for both sides to take a 30-second timeout to remind themselves what it is they are debating. Granted, intractability is a subjective measure, but if you ever find yourself standing in your kitchen with a pair of scissors in one hand and a shredded gym sock in the other, there's a good chance you've arrived. Judging by social media, we reached this point on Monday, when Nike fired the first salvo in a marketing campaign that not only includes Colin Kaepernick as a spokesperson but places his civil disobedience at the forefront. The response to the ad, which makes a veiled reference to the martyrdom of the former 49ers quarterback at the hands of NFL owners, fell along predictable lines. Those who howled at Kaepernick's decision to take a knee during the national anthem two years ago were now torching every Swoosh in their possession (the majority of which, we can only assume, were elastic sweatpants and white jogging shoes typically worn with tube socks). Before we consider the central question, let's make a couple of points. First, a brand-conscious multinational corporation does not make a decision like this without first having completed a thorough cost-benefit analysis of the impact on the bottom line. Nike is well aware of the depth of the emotion that a certain segment of the country feels toward Kaepernick and the movement that his demonstration ignited. It is well aware that the current occupant of the Oval Office shares those sentiments with that segment, and that both of those entities have been extremely vocal about their desire to conduct their consumption habits in a manner that benefits those whose viewpoints align with their own. Re-signing Kaepernick to a new endorsement contract and making him a focal point of a branding strategy, as has been reported by multiple outlets, is a bold move. But we should be careful not to conflate boldness with any of the attributes we tend to use for those whose singular priority is the greater good. Nike is not acting in a manner that we should consider courageous or heroic or intrepid. For-profit corporations are not selfless. By definition, they cannot be. They exist to generate profit, and we can be sure that, somewhere in Nike headquarters, there exists a rational, evidence-based plan that suggests its current pivot will enable Nike to sell more stuff. That's just reality. Second point: There is plenty of reason to wonder whether Kaepernick is really the martyr that his movement needs. One unfortunate side effect of polarization is that worthy questions such as this tend to get sacrificed to the cold realities of tribalism. Argument by opposition creates a lather that greases the skids toward entrenchment, and behind those walls there is no room for nuance, where common cause calls for a creation story that is united in its fundamentals. In this instance, the story portrays its protagonist as a still-in-his-prime Super Bowl quarterback whose current unemployment is singularly attributable to his social views. Nike's new ad, which features a black-and-white close-up of Kaepernick's face that elicits the feel of a death mask, carves this narrative into the historical record with the words that accompany it. The uncomfortable part of the messaging is that it leaves little room for someone who believes in the worthiness of Kaepernick's stand but questions whether it is the sole contributing factor to his exile from the NFL. It requires us to ignore the fact that the person in question was a polarizing football player well before he was a polarizing public figure. 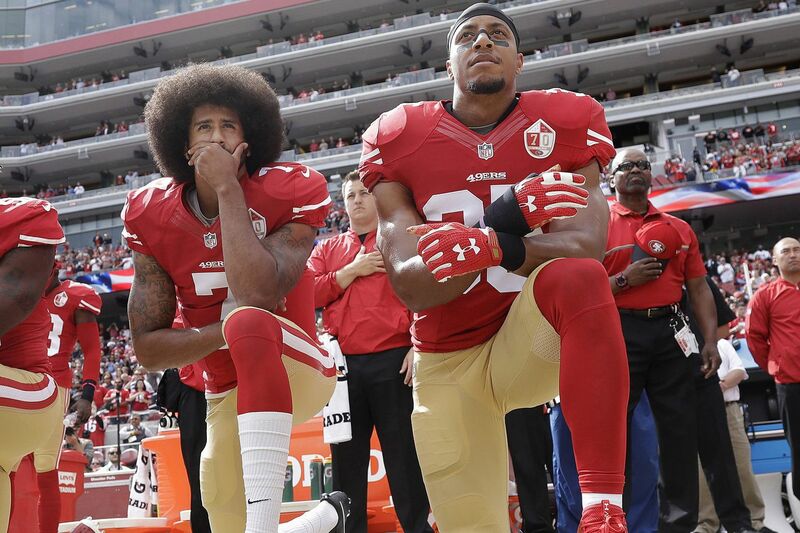 Kaepernick was benched by the 49ers nine months before he first took a knee during the national anthem, replaced by a player (Blaine Gabbert) who is currently a backup for his third team in three seasons. Before Kaepernick took a knee, there was an offseason full of anonymously sourced reports that questioned his commitment, his leadership, his standing in the locker room. Before Kaepernick took a knee, there was a proposed trade to the Broncos that, according to recent comments from Denver general manager John Elway, would have required the quarterback to sign a contract that was not to his liking. All of that is relevant when it comes time to diagnose why Kaepernick is not currently an NFL quarterback. As flawed a player as he is/was, there can be no doubt that he would have been, and might still be, an upgrade at quarterback for several teams. There can also be no doubt that flawed players are evaluated as much for their fit as for their skills, and that said decisions include both financial and distraction curves. No, Kaepernick is not a perfect spokesman. But that does not answer the question that is central to the current debate. Why does he make people so mad? What, exactly, are we debating about? Kaepernick and fellow demonstrators like the Eagles' Malcolm Jenkins believe that one of the fundamental promises that the American flag makes to those who swear by it is an equality before the law. They believe that to stand in unqualified deference to that symbol is to signal to all watching that said promise is being fulfilled. They believe that said promise is not being fulfilled. They are not protesting the flag. They are not protesting the anthem. In the most visible way afforded to them, they are demonstrating their belief that a more perfect union might yet be formed. A country that is good enough for you might not be good enough for them. You might contend that it is their method of expression with which you disagree. But then, they aren't the ones whose clothes are currently on fire.